Welcome to the Twin Robotz Comic shop, your place to purchase comics and any related merchandise. From time to time we may have special items up for sale like original art or autographed limited edition books or prints, so check back frequently. Shop away my friends. Paypal: Click on the book you want to puchase and you will be automatically brought to Paypal. Money order: You can make the money order out to "Wally Czyzniak" - email me for the address. NOTE: If you are ordering from outside the US, payment must be an International Money Order, made out in U.S. funds to "Wally Czyzniak". Please include the proper bank code. Cosmi- kiss is a story of teenage love and the complications that come along with it. The main character Tim finally gets his first kiss from his life long crush, and things take a turn for the strange. A one shot comic, the whole story is right in this issue. 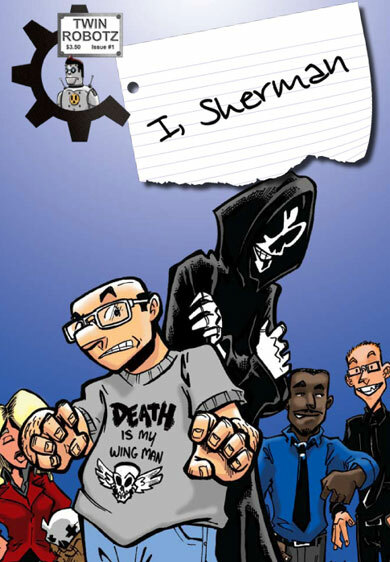 I, Sherman is the story of a down and out man finding he only has a limited time to live, and deciding to make the most of it. The physical embodiment of Death however, has other things in mind. The first issue in what will hopefully be a long running series.